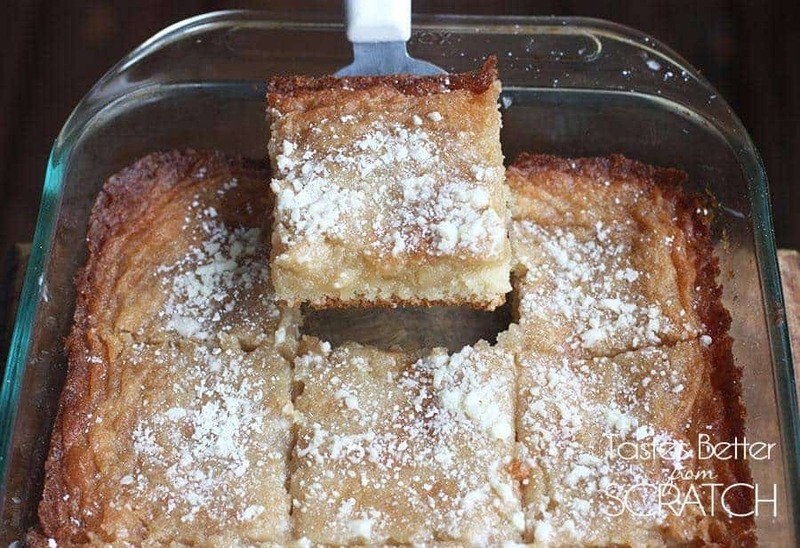 This Original Gooey Butter Cake is made with a yeast crust that is topped with a sweet and gooey butter cake mixture. It’s a real tragedy that it took me moving to Saint Louis before I ever heard about Gooey Butter Cake. The stuff is pure gold. And in Saint Louis, where it originated, it’s highly revered. This my friends is a true baker’s recipe, made from scratch. If you’ve ever googled “gooey butter cake” recipes you may have come across several that use cream cheese and a yellow cake mix. Don’t do it!! What a tragedy–that is not how the original Saint Louis gooey butter cake is made! You start with a yeast crust (don’t be alarmed, it bakes into a dense crust that’s amazing!) And it’s topped with a soft and sweet butter mixture. After baking, you sprinkle some powdered sugar on top and serve it with coffee as a brunch type of treat, or as a dessert. It has the perfect amount of sweetness and I can never stop at just one slice! 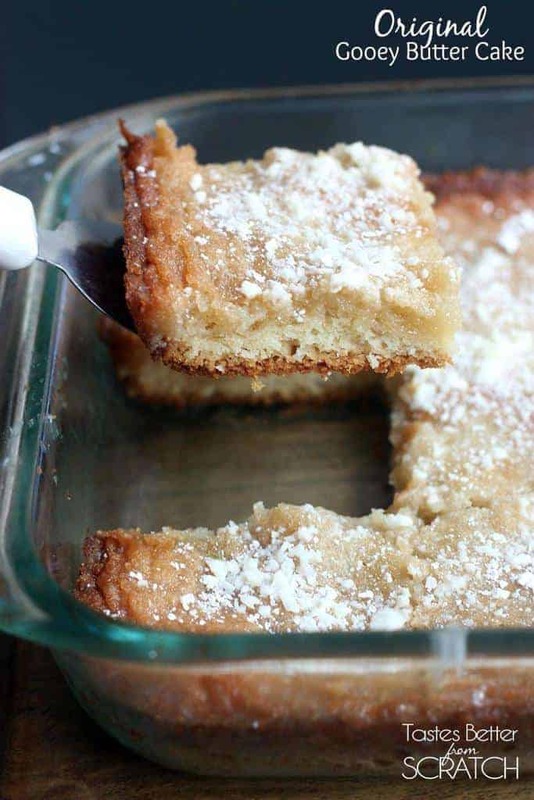 I LOVE Gooey Butter Cake, and this Original Gooey Butter Cake recipe is the real deal. In a small bowl combine yeast, 1/4 tsp sugar and warm milk. Set aside for 5 minutes. In a stand mixer cream together the butter and 3 Tbsp of sugar until light and fluffy, about 3 minutes. Add the yeast mixture, egg, salt and flour and mix on low until combined. Increase speed and mix/knead for about 7 minutes, until the dough is smooth and has pulled away from the sides of the bowl. Press the dough into an ungreased 9x13'' baking dish. Cover with a towel or plastic wrap and let rise in a warm place until doubled, about 2 hours. Whisk together light corn syrup, water and vanilla until combined. In a separate bowl cream together the butter, sugar and salt until light and fluffy, about 5 minutes. Add egg, scraping down the sides of the bowl. Add a little of the flour, alternating with adding the corn syrup mixture, until both are combined. Drop large spoonfuls of topping all over the risen dough. Use a spatula to gently smooth it into an even layer. Bake for 35-40 minutes or until the top has set and is golden brown. The center should still seem soft when it comes out of the oven. Allow to cool on a wire cooling rack to room temperature. Serve sprinkled with powdered sugar. This cake is best enjoyed the day it is made. « What’s in my Trick-or-Treat Bag?! This recipe was amazing! 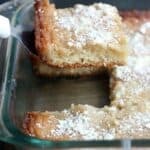 I am more of a chocolate lover by heart but my husband loves gooey butter cake so i gave this a try! It was chewy, soft and just amazing! We enjoyed it for days and it almost got better with time :). I grew up in St. Louis and Love Gooey Butter Cake. I am so glad to see you do not put cream cheese in it. this is the best cake ever. thank you for the recipe. Thanks Mary! I hope you get to try this recipe! I’m confused by the sugar amounts in the cake portion of the recipe. Is it cups or teaspoons and tablespoons? 3 tablespoons sugar is for the cake base. 1 and 1/3 cups sugar is for the topping. Dennis, I believe there is a typo in the recipe. The 1 1/3 cups granulated sugar is for the filling. The cake should only have 1/4 teaspoon of sugar. Do you have adjustments for high-altitude baking? I would suggest asking google.